BT Sport pundit Chris Sutton has claimed Rangers defender Bruno Alves will want to leave Ibrox during the January transfer window. Scott Sinclair won’t face any retrospective action over the penalty incident during Sunday’s Betfred Cup final. Cedric Kipre was sent off after Sinclair took a tumble in the box and although Motherwell claimed the Celtic attacker had gone down too easily, it is not thought that Compliance Officer Tony McGlennan will take any action. Rangers’ second largest shareholder is set to grill the Ibrox board at Thursday’s AGM over the hunt for Pedro Caixinha’s successor. The fans’ group is set to demand answers from Dave King and the rest of the board during or after the meeting later this week. Stevie May is hoping Aberdeen can capitalise on Rangers’ state of fragility twice in the next five days to pull a massive 12 points clear of their Ibrox rivals before the halfway stage of the Premiership. Rangers are seemingly rudderless as the frustrated supporters, who have witnessed consecutive defeats by Dundee and Hamilton under interim boss Graeme Murty, desperately wait for news of a permanent replacement for Pedro Caixinha. Craig Gordon feels that his stunning stop from Louis Moult during Sunday’s Betfred Cup final is among the best saves he’s ever made. Celtic had just opened the scoring when Gordon threw out his right arm to prevent a certain goal. 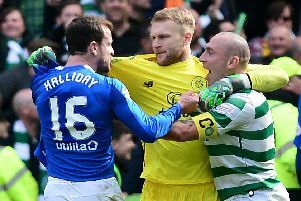 Five minutes later, Celtic had doubled their lead and Motherwell were down to 10 men, so Gordon’s intervention was a pivotal moment. Partick Thistle’s Danny Devine has warned next opponents Hibs that the Jags have no problem getting physical in a bid to win the match. Hearts will assess the fitness of Aaron Hughes and Harry Cochrane after both suffered injuries during Saturday’s draw with Ross County. Hughes was withdrawn at half-time with a tight calf, while Cochrane hurt his knee in the second half. None of the issues are regarded as overly serious.